"My show? My show is about three hours long. 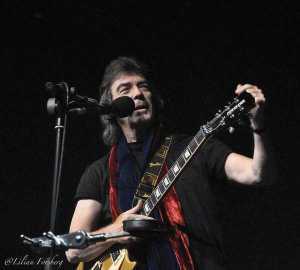 The first half is my solo material and the second is old Genesis songs; the Peter Gabriel years," says veteran guitarist and rocker Steve Hackett. "We'll be performing songs from "Acolyte," which is my first true solo album to my most recent "Wolflight." Hackett brings his "Acolyte to Wolflight with Genesis Revisited The Total Experience" tour to the Newton Theater this weekend on Sunday November 15 at 8 pm. A show which he promises will have something for all who have followed his career and thus far has been getting rave reviews. A native of London, Hackett rose to prominence as a member of Genesis; thanks to Peter Gabriel reading an ad he placed in "Melody Maker," a popular music publication. Prior to this good fortune, he was in two rock bands with "Progressive elements" and had made music with his brother; with whom he would have his first ever recording experience as a member of the band "Quiet World." Four decades later and a catalog of recordings behind him, Hackett is enjoying combining his past with the present. "I have a new album out and a lot of old ones too; it's an embarrassment of riches if I do say so myself," he laughed; seemingly satisfied and confident. "We've re-released all of the older records to coincide with the release of this new one and the new one is doing well. I look back and realize that I am really very fortunate; to have worked with the people that I have is really quite a stroke of good fortune. Besides Genesis, I've worked extensively with Chris Squire of Yes before his unfortunate passing and of course Steve Howe in GTR and so many others; I've been very lucky." When asked what has influenced him as a musician and an artist over the years, his response was varied; "I've been and I still am moved by all sorts of music," he said somewhat hesitantly. "Just today actually, I was listening to Roy Orbison; I absolutely love his voice. I've been trying to sing like him for years; I'm not sure that anyone can (laughs). I'm also able to say that I've worked some time back a bit with Richie Havens; he is, in my opinion, one of the greatest singers of all time. The rhythmic pounding, the way he played guitar and processed his vocals the same way; he was one of the best. I really am pretty fortunate, huh? I draw inspiration and get influenced by various things but mostly other musicians; I can always learn from them or enhance my creativity by interacting with others." The tour however; is an entirely different story. There is no variance when it comes to how well the road and audiences are treating Hackett and vice versa. Seems that he is more laid back in this undertaking and is applying a marathon approach as opposed to a sprint as in years past; even crediting a family member as inspiration. "This tour is absolutely wonderful! Things are much easier now for me than they were in the past. Back in the early '70's I used to party; ummm a little to much," he said laughing. "Now I prefer longevity and the secret to that is black tea (laughs); I drink a lot of black tea. I had an uncle who was 108 and I hope he passed those genes on to me; seriously. You see? That's me; I have always aimed for the impossible. I want to do things in music or experiment with sounds so that I can keep making viable recordings. So far it must be working because the audiences have been very receptive and quite kind and that's what it's about isn't it?" The audiences who have been filling the venues are not going away unhappy; as Hackett is enjoying presenting his old and new material but also relishes revisiting Genesis. Those attending can expect to hear just about everything from every Hackett project; with the exception of GTR. "Unfortunately I've not been able to work any of the GTR material into the sets just yet but I can promise you I'm looking into it and maybe one day down the road that may happen but for now it's all me and Genesis. People coming to my show are going to get a little bit of everything and if you're a fan of what I did with Genesis you should be very happy. I love that it has been going down so well, playing songs such as "Cinema Show," "Get'em Out By Friday" and "The Lamb Lies Down On Broadway;" I get a giant thrill out of it. It is old stuff, it's 40 years old but it still feels good to perform and it still works."